Sidney Reginald Blake was born in Yeovil around 1900, the son of leather parer Edwin Blake (1864-1952) and Mary Jane née Galliott (1862-1936). In the 1901 census Edwin and Mary were living at 33 Kiddles Lane (today's Eastland Road) with their family; Lilly (b1889), Albert (b1891), Rosey (b1892), Elsie (b1895) and one-year old Sidney. By the time of the 1911 census the family had moved to 22 Talbot Street with a new daughter, Hilda (b1903). Sidney enlisted at Taunton in 1918 although the exact date is unknown. He served with the 20th County of London Battalion (Blackheath and Woolwich), County of London Regiment (Territorial Force), his Service Number 634678. The 20th London Battalion had arrived in France the morning of 10 March 1915 and served in France and Flanders until the Armistice. Sidney would have been with his regiment when they took part in the Battle of Amiens, 8 to 11 August 1918. The Battle of Amiens, also known as the Third Battle of Picardy, was the opening phase of the Allied offensive later known as the Hundred Days Offensive that ultimately led to the end of the First World War. Allied forces advanced over 7 miles (11 kilometres) on the first day, one of the greatest advances of the war. The battle is also notable for its effects on both sides' morale and the large number of surrendering German forces. This led Erich Ludendorff to describe the first day of the battle as "the black day of the German Army". Amiens was one of the first major battles involving armoured warfare and marked the end of trench warfare on the Western Front. Within two weeks Sidney was in action again, taking part in the Third Battle of Albert (21-23 August 1918). This battle was significant in that it was the opening push that would lead to the Second Battle of the Somme. This attack opened the advance, with the main attack being launched by the Third Army along with support from the Fourth Army. The attacks developed into an advance, which pushed the German 2nd Army back along a 50-mile (80 km) front line. On 22 August, the 18th (Eastern) Division took Albert, with the British and Americans advancing on Arras. The Second Battle of Bapaume, between 25 August and 3 September, was a continuation of the Battle of Albert and is also referred to as the second phase of that battle. The British and Dominion attack was part of what was later known as the Allies' Hundred Days Offensive. The Second Battle of Bapaume consisted of three main attacks carried out over a period of two weeks and involved the divisions of IV Corps; the British 5th, 37th, 42nd, and the 63rd Divisions along with the New Zealand Division. On 29 August, elements of the New Zealand Division, after heavy fighting, occupied Bapaume. Sidney Blake was killed in action on 5 September 1918 having just participated in the Second Battle of Bapaume. He was just 19. Sidney was interred in Peronne Communal Cemetery Extension - Grave III.O.12. His name is recorded on the War Memorial in the Borough and is inscribed in the County of Somerset Book of Remembrance in St Martin’s Chapel, Wells Cathedral, page 174. 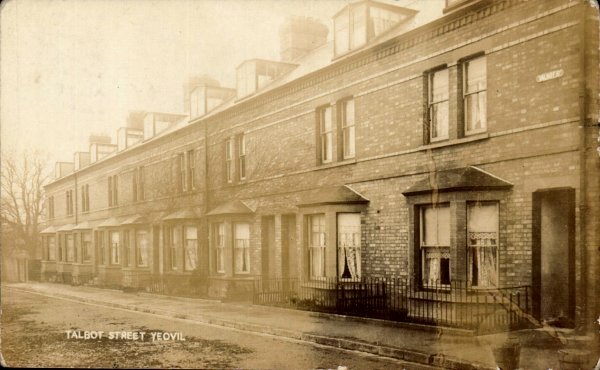 A postcard of Talbot Street, from around the time the Blake family lived at No 22. 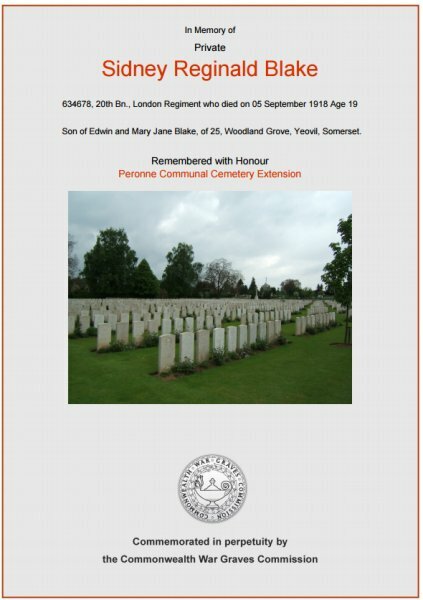 The Commonwealth War Graves Commission certificate in memory of Sidney Blake.